Elle: Webb is traveling for work, so it's all me today. We got up this morning and were on the bikes by 6:30am. It was still dark out, but as we suffered cycled our way through the workout, the sun slowly came up, which was kinda nice. To see the original review of this workout, read the post from SufferFestukah. I was definitely suffering today. Not just because it's required by The Sufferfest Federation during any Sufferfest workout, but because of the stitches that are currently covering the entire upper, inner right side of my mouth (due to the dental surgery I had last Friday). Ouch! So I stopped by the dentist office on the way to work this morning to make sure all of this mouth suffering was normal, and that nothing was infected. The dentist assured me that, although it will be sore and painful for several more days, that this is all par for the course. 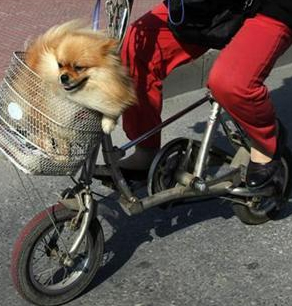 "No little dogs in baskets! #forbidden"